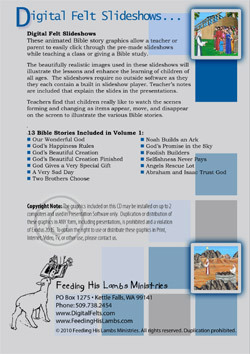 The 13 Bible Study Lesson slideshows on this CD correspond to the stories found at the beginning of the book of Genesis and include: Our Wonderful God, God's Happiness Rules, God's Beautiful Creation, God's Beautiful Creation Finished, God Gives a Very Special Gift, A Very Sad Day, Two Brothers Choose, Noah Builds an Ark, God's Promise in the Sky, Foolish Builders, Selfishness Never Pays, Angels Rescue Lot, and Abraham and Isaac Trust God. These slideshows are premade and not editable but come with notes that explain what part of the story each slide depicts. Double click the file of the program you want to teach and then just click your mouse to move through through the slides. All animations are preprogrammed. We highly recommend that you click through each slideshow atleast a couple of times before actually teaching the lesson, that way you will know when the various animations will happen. Requirements: The faster the computer the better, can run on Windows, Macintosh, and Linux due to the fact that these slide shows use Adobe® Flash technology.